Keep your small DSLR or mirrorless camera safely protected when you travel with the Realtree Max4 BodyBag Compact Telephoto from LensCoat. 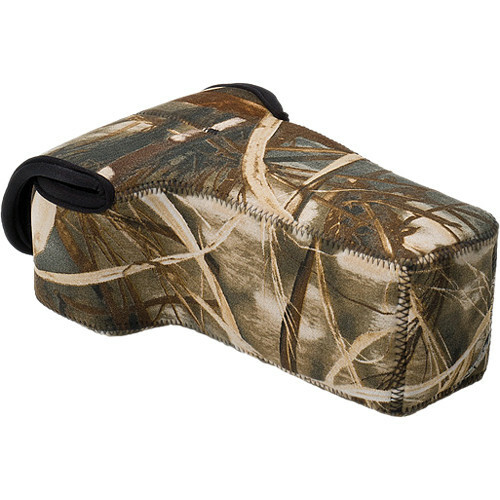 This fitted soft case is designed for compact bodies with lenses up to 6.5" long, and features a closed-cell neoprene construction that helps protect your gear from the elements. It works both to block dust, dirt, and water from coming in, as well as absorb the impact of small shocks and keep your camera safe from scratches or small dings. Included with the BodyBag is a removable plastic disc with foam on the inside, which serves to protect the front element of your lens during storage. You can quickly close the case via a touch fastener for transport, and either carry it by hand or simply place it in a small bag or backpack. The Realtree Max4 camouflage pattern offers maximum effectiveness in open terrain. The pattern incorporates cattails, millet, milo, corn stalks, sunflowers, oak and maple leaves, cedar and oak limbs, plus a variety of other plant life into the largest camouflage artwork on the market. It is made in the USA. Box Dimensions (LxWxH) 8.6 x 7.1 x 3.4"
BodyBag Compact Telephoto (Realtree Max4) is rated 4.8 out of 5 by 5. Rated 5 out of 5 by Jolinne from Perfect, just what I wanted! Before buying this particular one, I read all the reviews to figure out which size would be best. This particular one fits my D90 with a 18-250mm lens. There's still some room at the end for a longer lens, and the extra padding at the end is a nice bonus so there's added protection to the end of my lens. What I was really happy with is that I don't use a regular neck camera strap, but Black Rapid Cross Body strap, and I can lie it flat on the bottom and it fits nicely out of the side. I was worried that I would need to unscrew the fastenr/strap every time I'd want to place my camera in the bag. As most have already said, this bag shouldn't be used to really protect your camera, but it's just a little something to protect it from small digs and bumps. The seams are great to give the bag some form. Rated 4 out of 5 by sleinwand from Great fit for T3i with 100mm macro lens I love this pattern because it's more fun than plain black. The compact size of the BodyBag was perfect for my Rebel 3Ti with 100mm macro lens. One downside- it's not quite as easy to get the camera into the bag as with my USA Gear standard neoprene case but it just takes a little more wiggling. Also the corners of the camera stick out on the top a little more than other bags I've tried. But overall I'm excited about the pattern options and I can't wait to use it! Rated 5 out of 5 by David F. from Great for sightseeing! BosStrap sling with LensCoat cover is perfect for sightseeing with my Sony NEX5 & 18-200mm lens (with lens hood frontwards) when I don't want to carry a full camera bag with other lenses, filters, etc. Very easy to use.